6th Avenue Exit was first published in The Shanghai Goon-Rat: The Literary Journal of the Hawaii Sport Parachuting Council on October 29, 1977 in Aiea, Hawaii. THERE ARE THOSE who say that the 6th Avenue exit does not exist. 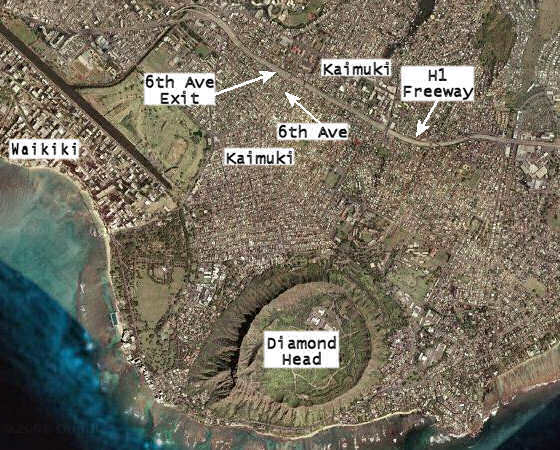 They will say that the lights seen lining its off-ramp nightly are an as yet unexplained natural phenomenon, a strange quirk related in mysterious ways to the refraction of light at some locations in such close proximity to Diamond Head. But then, there are also those who would deny the sun its existence. Misunderstanding breeds fear; fear yields denial and the impulse to destroy. Some misguided miscreants would destroy anything they do not understand, and thus unconsciously admit to its power over them, admit to its being greater than them. But the existence of the 6th Avenue exit, though, like many things in the universe, unprovable in any absolute way, may after careful study be inferred by the circumstances surrounding it. The sign appears no different from any other one sees along the H-1 freeway. Heading southeast as the freeway passes through Kaimuki, directly north as the crow flies from Diamond Head, on the island of Oahu in the middle of the Pacific Ocean, it appears: a rectangular field of dark forest green with reflective white lettering and a white border, the white arrow pointing towards the upper-right at precisely a fourty-five degree angle, exactly half way between vertical and horizontal. There has been, in fact, much discussion concerning what unknown hands must surely have attached the arrow so carefully to the sign. Were they even human hands? Were compass and protractor used to set such a perfect angle, or perhaps, as some have suggested, some more arcane and mysterious way of determining its exact placement on the green background. Some speculation has it that the arrow was set in such a way that were a line to be extended, perfectly straight, out towards the sky coinciding exactly with the line and direction of the arrow, it would point to a certain star or constellation that would reveal a meaning of some kind or provide needed answers to the whole idea of the 6th Avenue exit. An idea which, strangely enough, is often considered to be a question. Others feel that such a careful placement is unlikely; the arrow was merely attached at random immediately to the right of the words “6th Ave.” These poor souls, of course, are using “random” in the common layman’s fashion, ignoring the fact that nothing happens “by chance” or “randomly.” When a so-called scientist says that something happened “by chance” he is just saying he does not have any idea why or how it happened. When he says something was a “random” occurance, he is clearly stating he knows nothing of the true cause and is moving on to concentrate on the observable effects. Yet others will go further and say that the problem is discovering the correct instant during the year in which to view the arrow, for constellations whirling slowly across the sky in a huge arc as the year progresses are never in exactly the same position relative to the viewer as the night before. Should one study the sky at the end of the arrow’s point during the vernal equinox or the summer solstice? The debate rages. Rumors abound. Many indignantly refuse to discuss it. 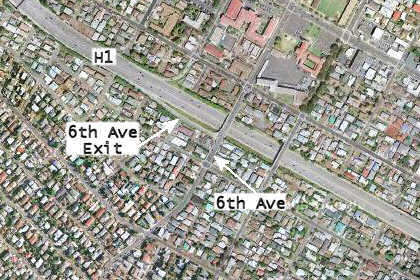 Certain persons knowledgable in all facets of the 6th Avenue exit will carefully explain to an inquirer that the arrow, whether showing some special direction or not, is rather unimportant to the central idea and a complete understanding of the exit. They will admit the possibility that yes, the arrow was set quite deliberately, but for entirely different reasons than common speculation dwells upon. There is, they say, the distinct likelihood that the arrow and its direction, being so immediately visually apparent, were meant to intentionally distract the simple passer-by, the average driver or passenger with merely an idle curiousity. Getting beyond the arrow, and beyond the exit itself is the key, so they say. Perhaps the key to our existence. Or, dare it be mentioned, non-existence. But then, why the deliberate distraction? No one, to be sure, knows. AND YET, BEYOND all argument, after all the ultimately useless discussion, still, there lies the feeling of the 6th Avenue exit that can only be experienced by taking the exit itself, by actually driving the concrete and asphalt that make up its path. A feeling left mostly undefined, not even recognized as a “feeling,” but most certainly existing as a distinctly separate force, an aura, lurking in the shadows of the brain’s myriad convolutions, unnamed, unlabeled. Like everything else about the exit, feelings about it are best deduced in a roundabout way, inferring certain things by studying their surroundings or effects. And this convoluted way of arriving at an idea, an opinion, or even a fact regarding the exit, is also much discussed. One theory much in vogue recently is that the 6th Avenue exit is waiting. To describe an inanimate object as waiting seems silly to some. For if it is waiting, it must be waiting for something, expecting you might say, and this would imply a consciousness of itself, of its waiting, and of what it is waiting for. But this line of reasoning occurs only because the mind usually limits itself to reference points from direct experience, refusing even the exploration of any line of thought leading to a conclusion that could not be supported by the past, which, during the ever-present now, is itself real only in the mind. The mind feeds on itself, circling about vulture-like, a perpetual paradox of denial. Waiting, by definition, implies a motivation for waiting, a reason. Our definitions, then, must be refined. Why can we not simply define what the 6th Avenue exit does as “waiting?” Merely waiting—waiting when someone drives onto it and glides along the off-ramp; waiting when another speeds past with just a quick sideways glance. Waiting, just as we wait for our lives to happen. Waiting, until we realize not why it is there, but why we have created it and defined it as we have, why we have required these definitions of it, why we have even required definitions at all. For we are shaped and ruled by our definitions, so we must be very careful how we choose to define things in life. Is this then, ultimately, the message of the 6th Avenue exit, its lesson for us? For it leads us finally back to ourselves, and our definitions. Some have even gone so far as to define the 6th Avenue exit as a mirror. It returns us to ourselves and leads us to question definitions which were former beliefs. As everything, as anything of value does. 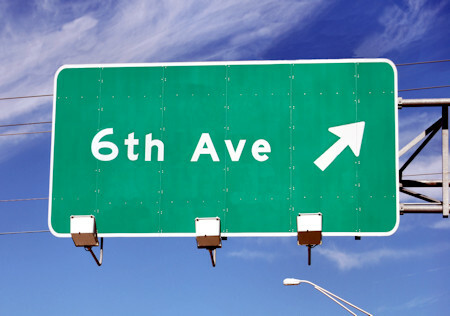 The 6th Avenue exit is not something that can be “known”, or whose “purpose” can be discovered. It must be experienced, without prejudices or a priori assumptions about reality. It is there waiting for us. NUMEROUS SIGHTINGS HAVE now confirmed reports of the shabby old bearded man with a weather-beaten khaki knapsack sometimes seen standing at the curb as you reach the end of the exit’s off-ramp and turn onto 6th Avenue. Referred to as “The Sage” by the cognoscenti, but derided as a lunatic by the misinformed, he has told anyone who stops to talk that you will get from the 6th Avenue exit exactly what you need. No more, no less. And since, as he says, most of this race of earthlings know nothing of what they need, only what they want, what you get may be quite unexpected. The Sage will ramble on and tell you of how Albert Einstein once defined “space” as “love” and will tell you that you are there at the exit because you are supposed to be there. By definition, if you are there, you are supposed to be there. Nothing, he says, happens without a purpose. The 6th Avenue exit has drawn you there with its own special gravity. Gravity, he pronounces with a sweeping gesture of his arm, is merely the earth’s love for us; she does not let us go, because she loves us. IT WOULD BE wishful thinking, and somewhat less than the truth, to say that all roads lead to the 6th Avenue exit. They do not. But from the exit, you may take any road you wish.